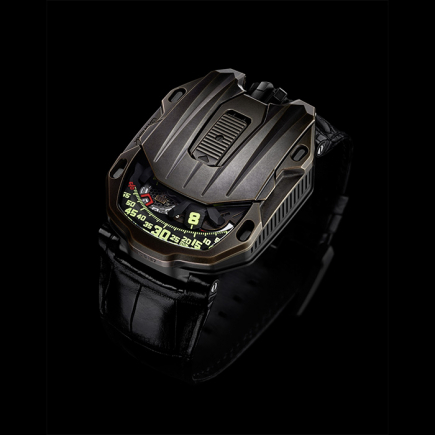 urwerk | 108'000 € Tax inc.
For URWERK, a precision timepiece should have at its base a movement that is accurate, reliable and long lasting. 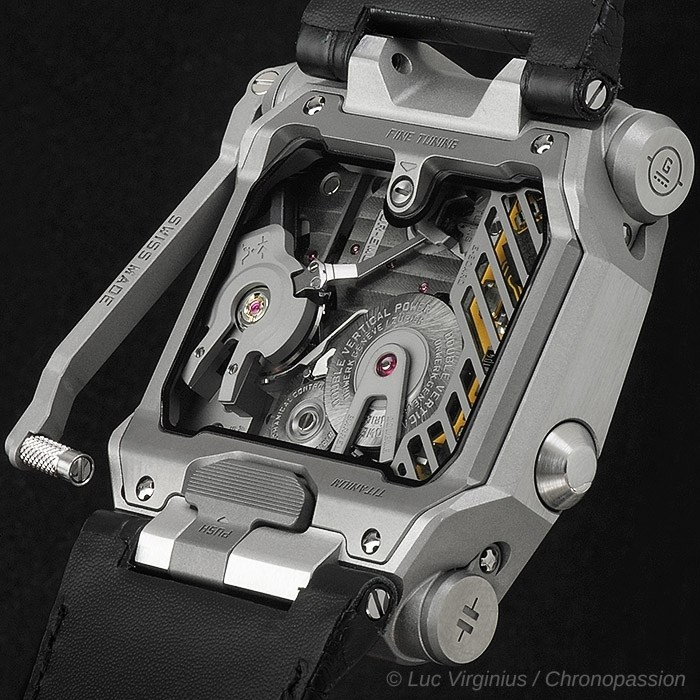 Such a movement should meet specific criteria including accuracy in 5 positions between -4 seconds and +6 seconds over 24 hours. 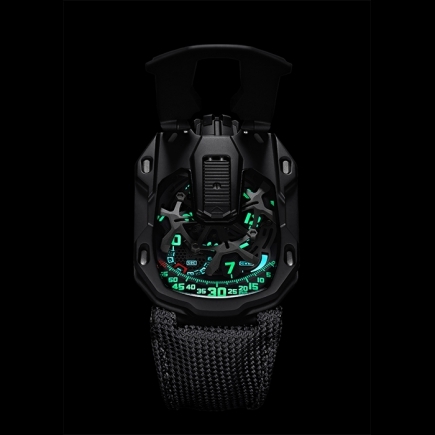 However, while it is one thing to regulate an accurate watch in the controlled world of a workshop, performance in the sometimes-extreme real world, i.e. 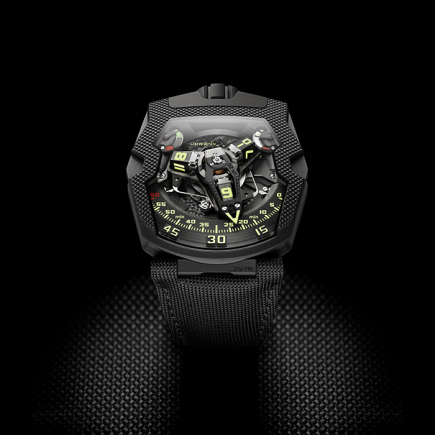 on the wrist, can be very different. 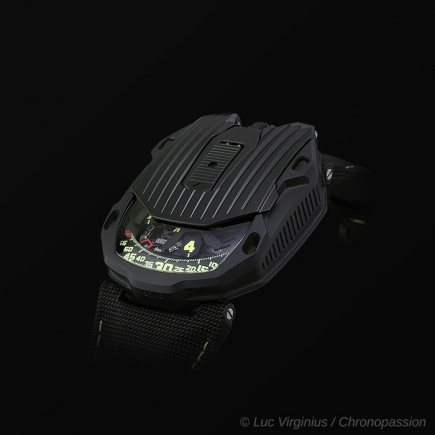 Changes in position and temperature, and shocks, can all adversely affect isochronism (timing regularity) of a wristwatch. 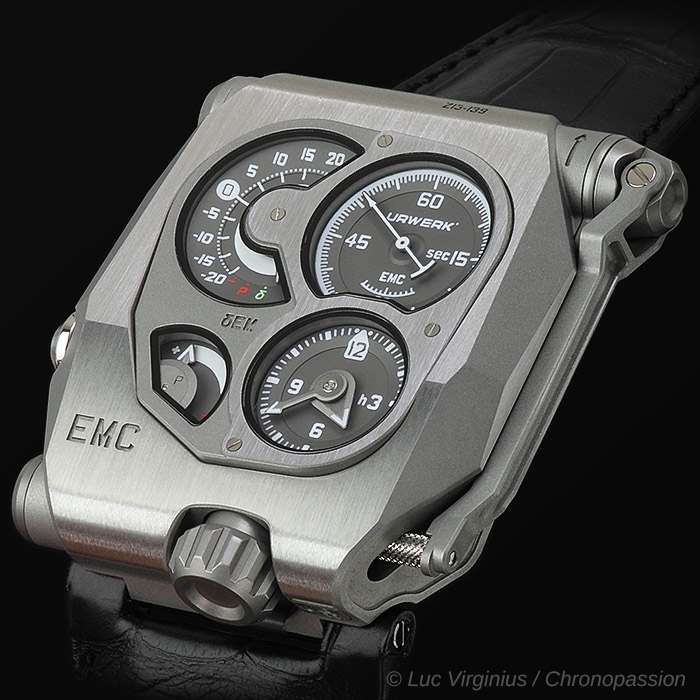 The challenge with EMC was in developing a mechanical watch that can be regulated by its owner to obtain the finest chronometric performance. 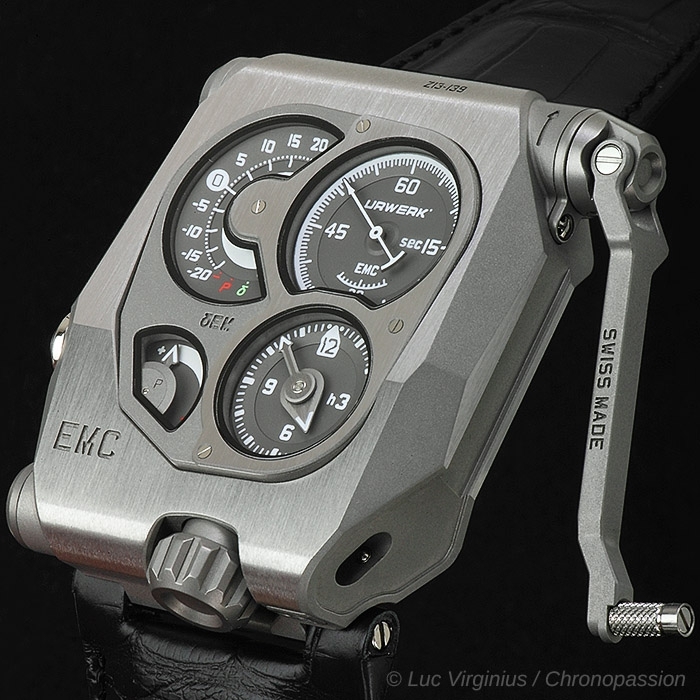 EMC is the first precision mechanical watch that enables timing to be both easily monitored and easily adjusted by its owner. 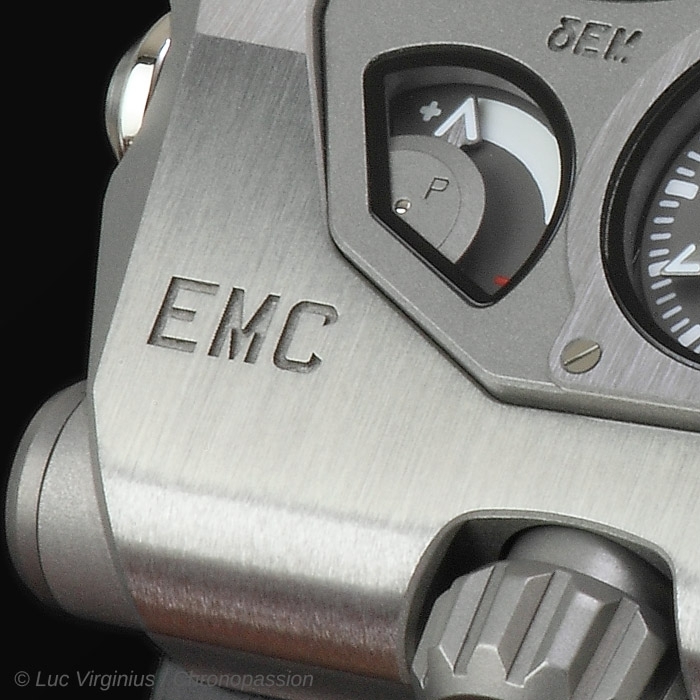 Please note that EMC is a fully 100% mechanical watch. 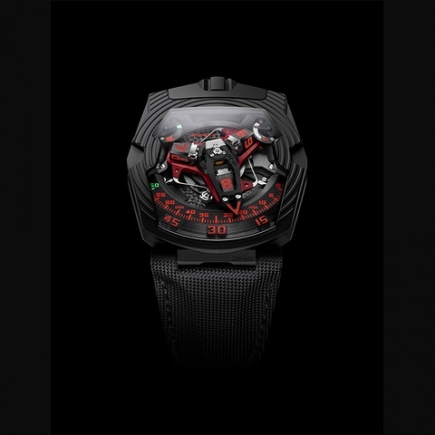 The electronics have absolutely no effect on the movement; they only enable monitoring of the movement's precision in a similar way that the electronic speedometer or rev counter of a car has no effect on the mechanical engine and gearbox. 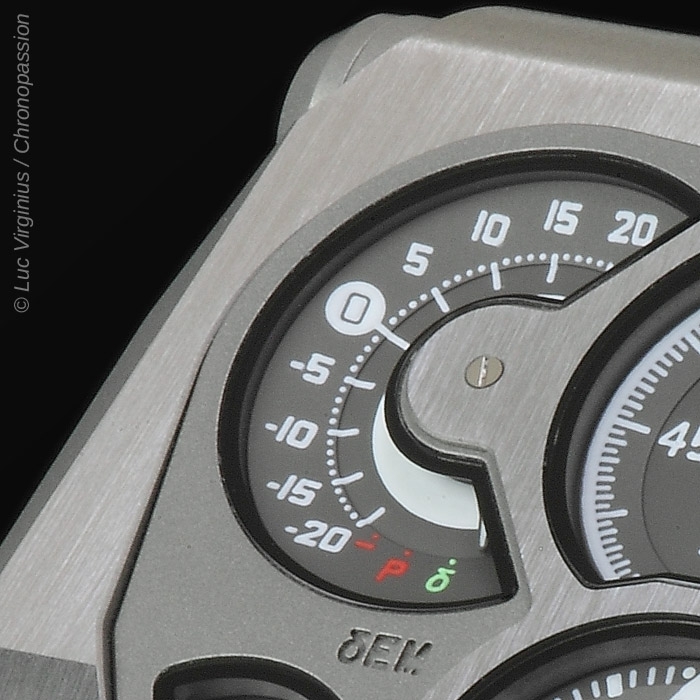 EMC features a deconstructed dial with four separate indications: A clockwise tour of the displays, from top left, presents the: on demand, precision indicator (instantaneous rate delta δ) ranging from -20 to + 20 seconds per day; seconds dial with counter-balanced seconds hand; hours and minutes; and 80-hour power reserve indicator. 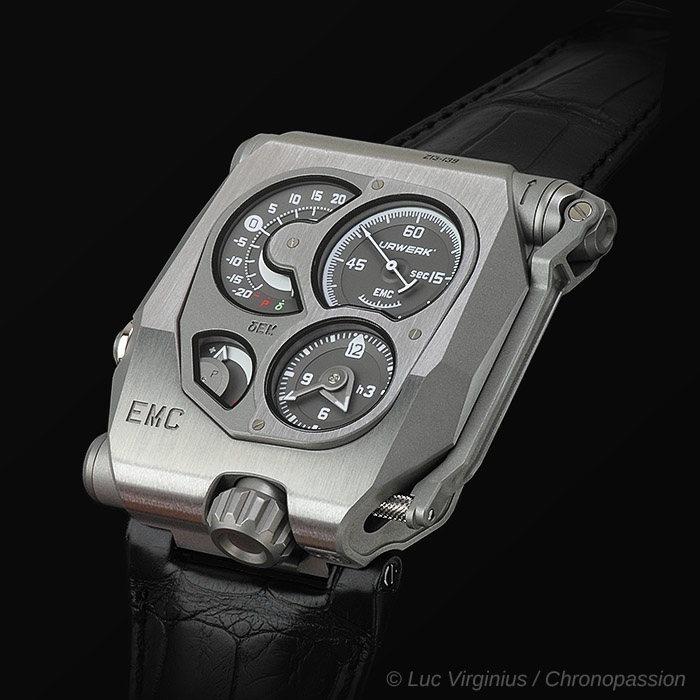 Turning EMC over reveals the fully in-house movement with the integrated circuit board – the EMC 'brain' –, the top of one of the two mainspring barrels near the crown and the top of the balance wheel and optical sensor on the winding handle side. 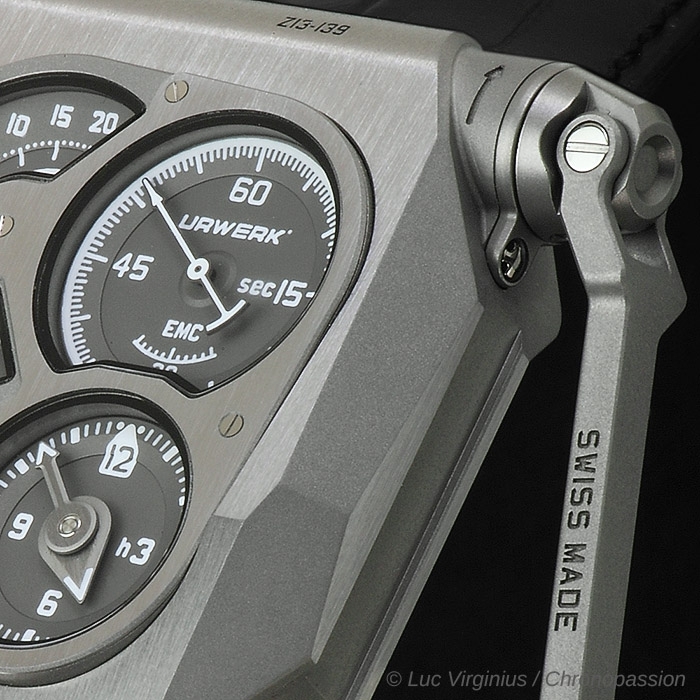 The audacious idea to incorporate a Witschi-like measuring instrument in a mechanical watch became a veritable quest for URWERK. 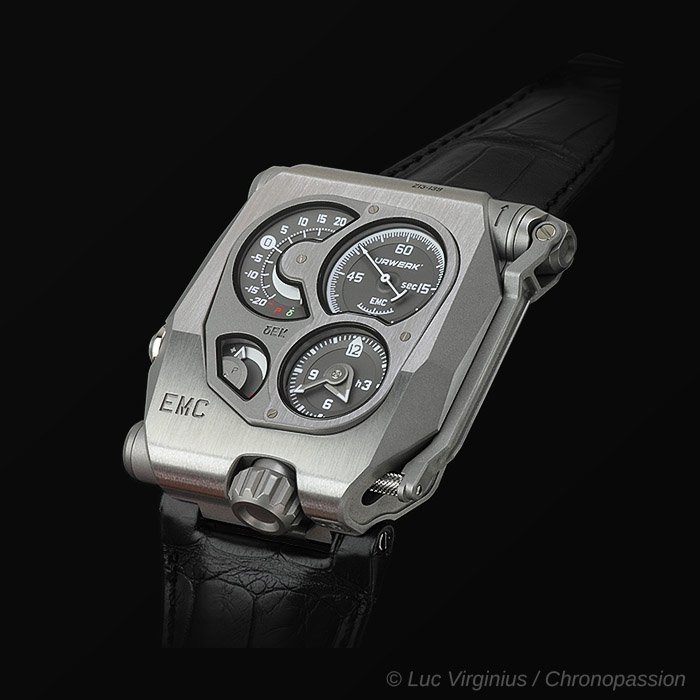 “EMC allows you to obtain a reliable and accurate piece of data on your timepiece at the touch of a button – information that until now has been the preserve of professional watchmakers,” says Baumgartner. 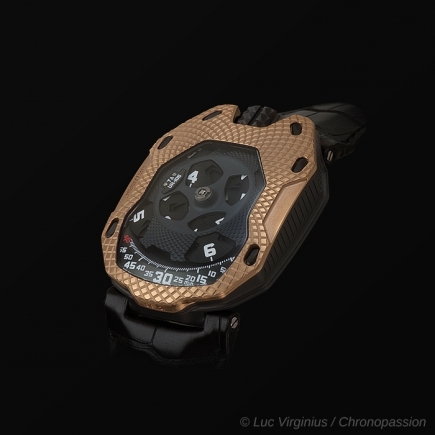 “Using this information, you can fine-tune one of the most exciting, most jubilant mechanisms invented – the mechanical watch – all by yourself.” At its heart, EMC has a triple objective: to show how external parameters (positional changes, temperature and pressure) influence the timing of the movement; to enable the wearer to adjust the timing; and to facilitate interactivity between the timepiece and its owner. 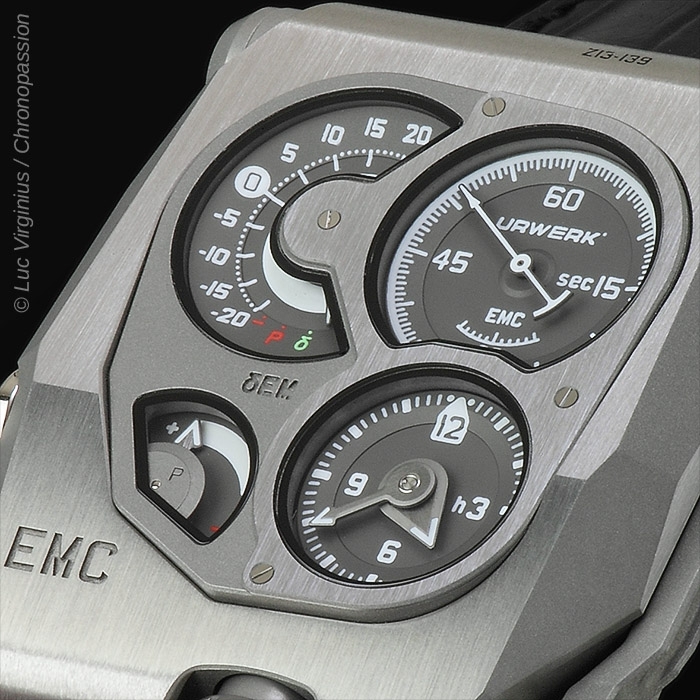 EMC is inherently a precision mechanical watch with an in-house movement conceived, developed and crafted in the URWERK ateliers in Zurich and calibrated by URWERK in Geneva. 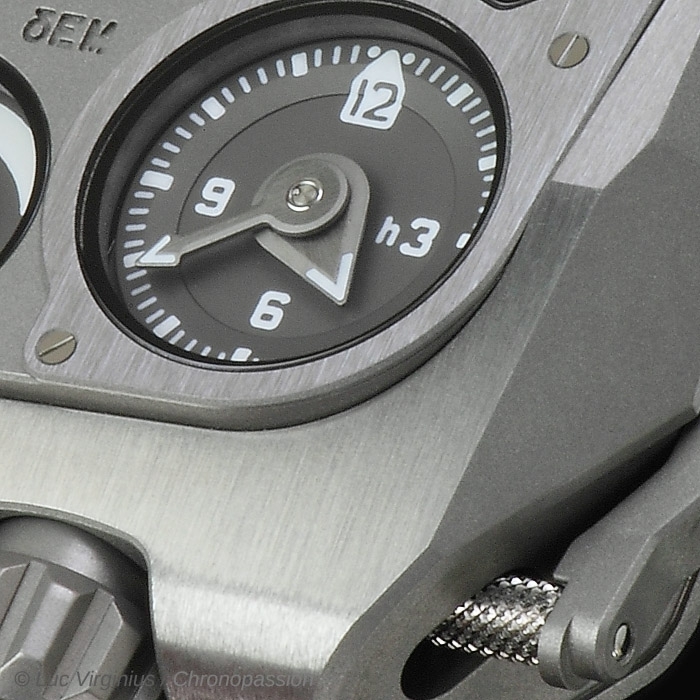 The movement meets the most stringent quality control, with its chronometric performance tested in five positions during a 30-day cycle to ensure that it meets the highest standards for a precision watch. 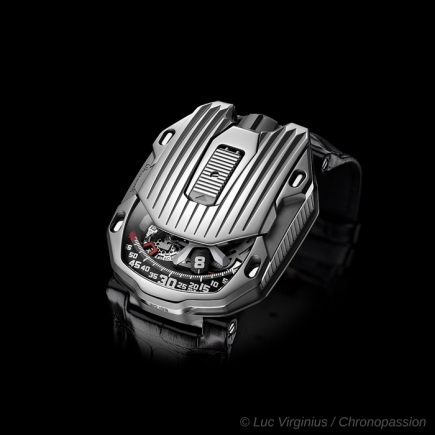 - An optical sensor on the balance wheel capturing the precise rate of oscillation of the 4 hertz / 28,800 vph regulator, over a period of 3 seconds. 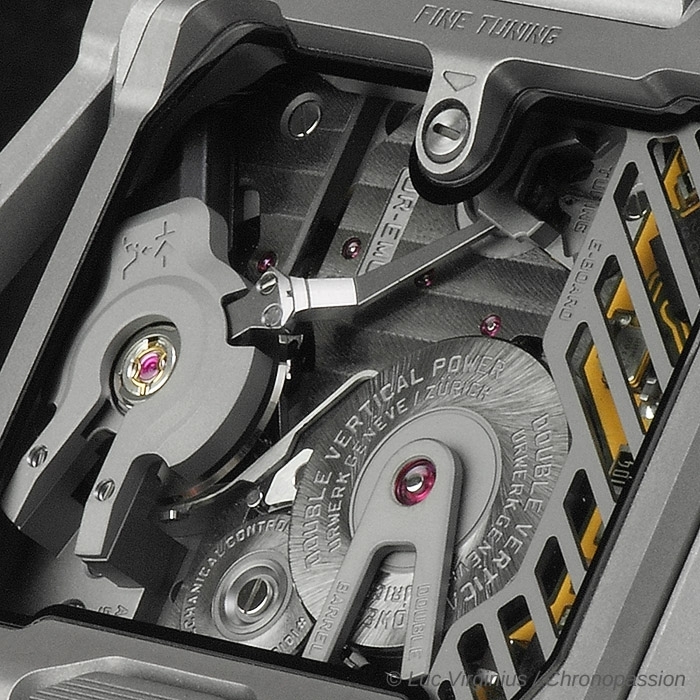 This sensor consists of a transmitter and a receiver positioned either side of the balance, and is triggered manually by pressing a button on the left side of the case. 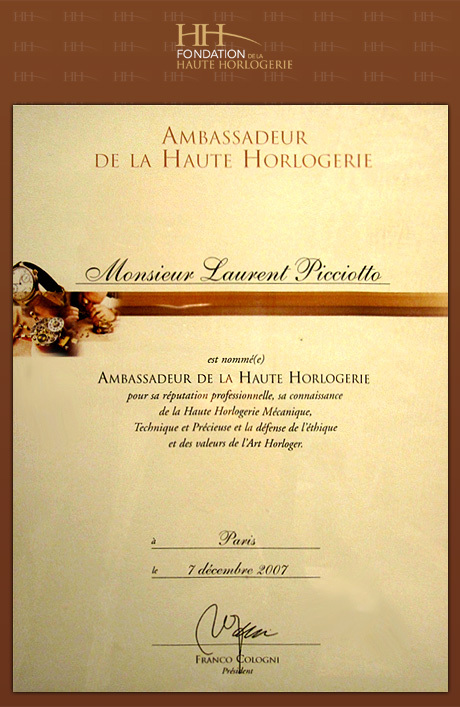 - Artificial intelligence (the computer) This computer determines the difference between the timing rate of the movement and that of the reference oscillator. 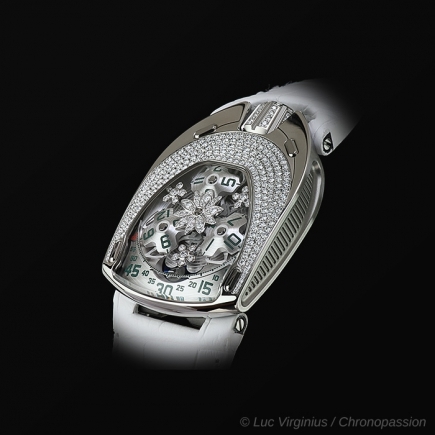 Each microsecond difference between the two values is expressed as a gain or loss of a second per day of the timing rate. 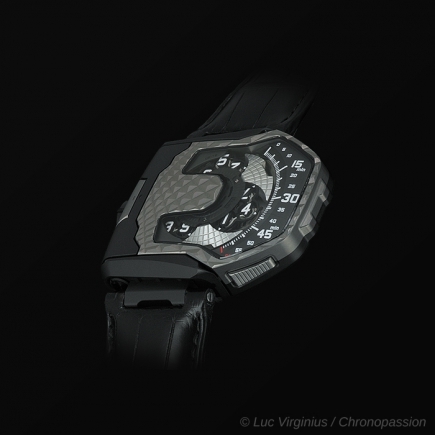 A variation of just 0.0000014 of a second per half-vibration translates as a variation of a second per day. 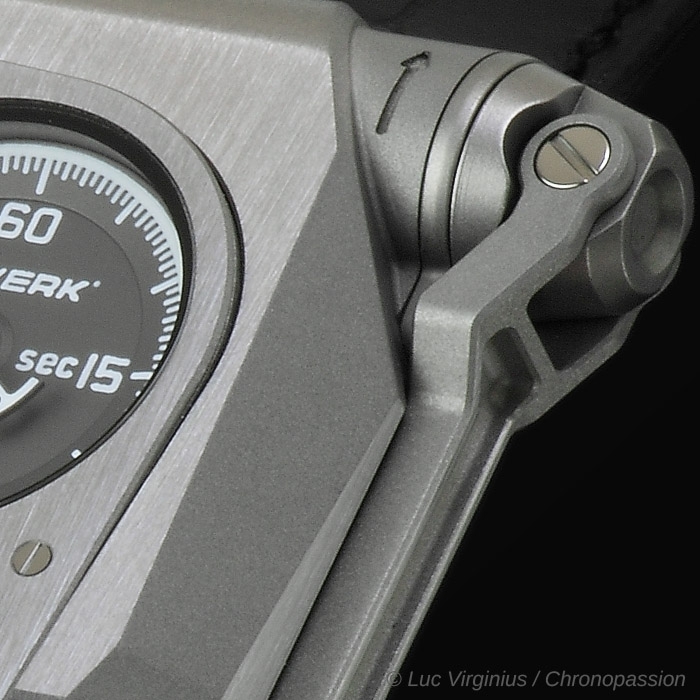 Hours, minutes, seconds; precision delta, power reserve.